Automated food delivery systems are a staple of retrofuturism. They show up as window dressing in anything from the softest of sci-fi — the Jetsons’ wall-sized breakfast machine [YouTube video] features an array of buttons like “bacon” and “cereal” — to the hardest, as in Larry Niven's Known Space, where auto-kitchens recycle vegetation into edible bricks. Yet the reason the automated kitchen has enjoyed such a sustained existence in fiction is almost entirely down to its equally impressive real-life history. After all, eating is a universal need, so humanity has had a long time to consider automating it. But while we’ve turned other automated necessities, like travel, into massive industries, the private automated kitchen hasn’t caught on. So, what does history tell us and what might the future still bring? The term “automat” — adapted from the Greek term automatos or “self-acting” — refers to any restaurant in which food and drinks are delivered by machine. The first one opened in Berlin, Germany, in 1897, under the auspices of engineer/entrepreneur Max Sielaff. A sweeping array of wall units dispensed soup, sandwiches and drink from coin-operated spigots. The Wizard-of-Oz-style secret: Workers behind the wall units were constantly restocking the tureens and sandwich canisters. Automated restaurants soon sprung up in Spain and the Netherlands, and the UK’s Cambrian Coast Express even introduced automat buffet cars. 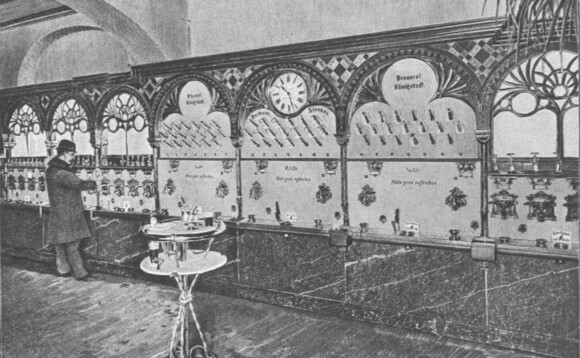 The automat reached the US in 1902, in Philadelphia. By 1933, New York City alone saw 40 automats citywide. Sci-fi literature mirrored the automat: 1912’s Princess of Mars depicted John Carter of Mars’ discovery that Mars restaurants push meals up through openings in the tables themselves. These “auto-magic” tables would even appear in a real-life hotel in 1931 Massachusetts, which installed dumbwaiters directly into their tables. Yet the automat didn’t last. The answer behind the automated kitchen's seemingly shocking failure as an industry is not that we’ve failed to turn it into a business. It’s that we’ve succeeded at driving it out of business. Few of the coin-operated food windows so popular in the 1930s could handle any payment more complicated than nickels and quarters (which even had be inserted in order), so over-the-counter fast food delivered a quicker and less complicated meal. Inflation also impacted the industry, as current technology could handle coins but not bills. By the 1970s, the automat was obsolete, many of them converted into Burger Kings as a final indignity. Part of the blame fell on computerization, the true automation of the 20th century. The mechanical automats had always demanded attention behind the scenes, making them a far cry from true automation. Even a 2000s NYC automat revival, “BAMN,”closed in 2009 after two and half years. But if slow, low-functioning technology was the constraining factor, perhaps the automat can make an AI-powered return in the 2030s. At least, that seems more likely than the return of the 1950s’ automated dream. The retrofuture is a bizarre world of futuristic inventions paired with cigarettes, sexism, and the continued existence of Pan Am. Appliance company Frigidaire’s contribution to the genre included an entire kitchen designed to be truly automated. Frigidaire’s decision to align itself with the ‘50s futurism trend was a natural one. The company brand was already centered on the latest in modern appliances: Its name connotes the electric self-contained refrigerator that the company pioneered during its inception in 1918, and may even be the source of the slang term “fridge”. Frigidaire’s much-hyped prototype for the electric self-contained kitchen, however, was absurdly ambitious, as a scene in a 1956 promotional film from General Motors proves. For the film, inserting the correct computer card propels the kitchen into a series of tasks that complete a food product completely autonomously. It’s a trick that would reappear in the original Star Trek series, where a computer creates any food once its corresponding computer tape is inserted. Later TV shows in the Trek universe would simply use world-hunger-eliminating replicators. Sadly, most of Frigidaire’s card-determined tasks are not seen, as the woman testing the kitchen out simply puts a dish into a spinning plastic display dome and then tries on several outfits while singing to herself, as 1950s women presumably did in their spare time. She returns (“The Kitchen of Tomorrow is calling me!”) to find a birthday cake complete with lit candles, a technological marvel that would be more impressive if it were ever explained. A similar future kitchen was featured in a film for Tomorrowland’s Monsanto "House of the Future" [YouTube video]. The kitchen offers dish-washing ultrasonic waves, shadowless lights, and pantries that descend from the ceiling, presumably for no reason more high-tech than saving space and looking cool. The innovations of the 1950s kitchen prototypes were occasionally genuinely smart, like the vinyl floor that “cleans in a jiffy”. But for the most part, they were simple yet pointless (like descending pantries), or amazing but impractical (like a machine that can insert lit candles in a cake). These promotional films probably impacted science fiction more than real life: The kitschy camp of retrofuturism appeals to many. 1989’s Back to the Future Part II was a parody of the future rather than a prediction of it, and so when a hidden fruit platter descended from a dining room ceiling [YouTube video], the moment harkened to the retrofuturistic dreams of the 1950s. The fact that the fruit platter wouldn’t retract without a low-tech smack on the side, of course, harkened to the difference between those dreams and reality. While the concept of “automated kitchens” has evolved significantly since 1897’s Berlin automat, it hasn’t managed to make the single largest leap separating it from science fiction: No automated process can completely create food and drink. Coin-operated soup vending machines are easy enough, and magical cake-producing counters are fun. But the food replicators of Star Trek would have a seismic impact on the economy—by the end of this century, Earth’s peak population is estimated to hit 12 billion. An economic form of food creation could stem rising world hunger. And it might soon exist: NASA’s working with a company on the 3D-printed version. In 2013, Systems & Materials Research Corporation, headed by mechanical engineer Anjan Contractor, received a six-month, $125,000 grant from NASA to create the prototype for a “pizza printer”. Pizza’s a natural choice for a 3D-printed food item, as the nozzle can spray pastes in three distinct phases to construct it. The dough stage, the tomato base stage, and the cheese stage, off-settingly termed the “protein stage” by the team. The powders and liquids combined within the printer will have shelf lives of around 30 years and might be formed from materials as weird as algae or insects. An early prototype, frantically stenciling out a pizza, was posted to YouTube on November 2013, and Contractor posted an image of the fully cooked version in the comments. I’ve certainly eaten pizzas that looked worse. Other 3D-food-printers exist: 3D Systems's ChefJet printer can produce Lucky-Charms-style sugar candies in a variety of colors, and Natural Machines’ Foodini printer blends ingredients from five different capsules to create a raw product designed to be cooked in consumer-facing kitchens. Contractor’s printer may soon compete with the Foodini: While the NASA-sponsored product’s short-term goal is to aid in deep space travel, the long-term goal would see it as a common household appliance. The flexibility of a 3D printer’s output will provide a variety of tastes, but it will also serve a practical function: Individuals can tailor their meals to fit certain dietary restrictions. Printable food can ward off allergic reactions that MREs or other current survival foods might not. Even better, no food will be wasted when it can be printed an ounce at a time from ingredients that stay good for decades. Interestingly, the downloadable recipes for each type of food generated in a 3D printer can be shared between users, like a software version of the computer cards that Frigidaire’s Kitchen of the Future relied on. It’s proof that, properly reimagined, even the most ridiculous aspects of the automated kitchen’s history can be realized. Adam Rowe is a freelance science and technology writer. He splits his freelance research time between finding bizarre science facts and bizarre science fiction, documenting it all @AdamRRowe.